The conference continued into Thursday, but ended at lunchtime. With Chris and me flying out of San Francisco to Sydney (via Los Angeles) at 19:00, this gave us about four hours to do stuff before having to get ready to go to the airport and check in for our flight. This would have been barely enough time to get into San Francisco and back, so there was no real option to see anything in the city. So instead I Googled for something closer: "burlingame tourist attraction". 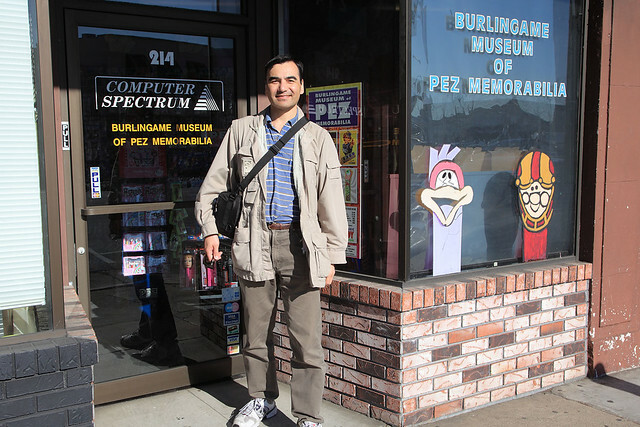 The top hit was the Burlingame Museum of PEZ Memorabilia! It sounded kitschy, but a fun enough way to spend an hour or so, and it was walking distance from our hotel. We had to check out by 12:00, so left our bags with the concierge. Fortunately the hotel had a gym and pool, with adjoining change rooms with showers in them, so we planned to have showers and change before leaving for the airport and our 20 hours or so of travelling. But first we headed into Burlingame. Being lunch time, we stopped in at an Italian restaurant for some food. I had a bowl of minestrone and then tortellini in a creamy sauce, while Chris had a veal scallopini with mushrooms. We got free sourdough bread with olive oil and balsamic vinegar to go with it. Everything I had was very nice. Then we walked down a few blocks to the PEZ Museum. I'd naïvely expected something a little grand, but it was simply one street-front shop amongst a row of others lining the street. The front consisted of a shop in which various PEZ items were for sale, dispensers in various shapes and the candy itself. 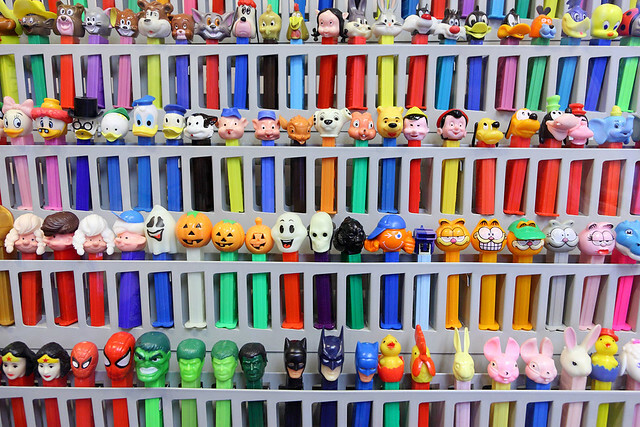 Recent release PEZ dispensers filled a wall, costing less than $3 each. But this was merely the prelude to the main event, as the incredibly enthusiastic guy running the store asked us if we'd like to see the Museum. of course this was what we came for, so we handed over our $3, which the man told us would get us a personalised guided tour! Burlingame Museum of PEZ Memorabilia! He led the way through a door into the back room of the shop, which was about the same size as the front room. This was the museum! It was small, but it was lined on all sides with more PEZ dispensers than I'd ever known existed, as well as other PEZ-related items such as posters, jigsaw puzzles, plaques, and even copies of the original PEZ patents! The guy gestured grandly at a poster on the wall and intoned seriously that PEZ was invented in Austria in (whatever year it was; I thought he said 1940, but Wikipedia says 1927). Chris interrupted and said she thought it was American. The guy didn't skip a beat as he said, "Yes, that's a common misconception!" He continued with a presentation about the history of PEZ that was, frankly, enthralling, both for his obvious deep knowledge of the topic and his infectious enthusiasm. He showed off his impressive collection of over 900 different PEZ dispenser designs, which included the exceedingly rare customisable face dispenser - a sort of miniature Mr Potato-Head with detachable eyes, mouth, nose, and so on. It was rare because it was sold for only four weeks before it was banned for being dangerous, with the tiny pieces easily swallowable by children. It was now worth over $3000! Then as well as the officially released dispensers, there was a collection of customised dispensers, with unique figures sculpted by enthusiasts. Mounted on the walls above these were framed PEZ dispensers with photos of various celebrities - the dispensers autographed. 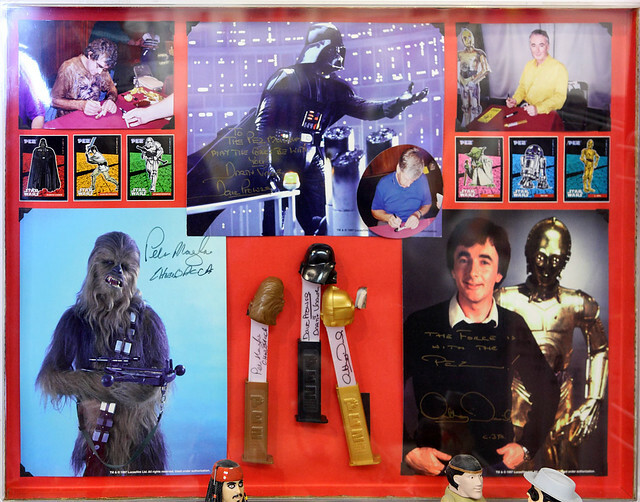 There was a Garfield dispenser signed by Jim Davis, a Peanuts one signed by Charles M. Schulz, and various Star Wars ones signed by Carrie Fisher, Peter Mayhew, David Prowse, Anthony Daniels, and George Lucas. But wait, there's more! Not only was this a museum of PEZ memorabilia, it also contained a collection of vintage toys, which the guy defined for us as being toys over 50 years old, and still in production. There were antique LEGO blocks, Erector sets (which we recognised as Meccano), Lincoln Logs, Viewmaster 3D slide viewers, and other classic toys. And still more: There was a collection of old toys that were banned for being dangerous, including the infamous Lawn Darts. 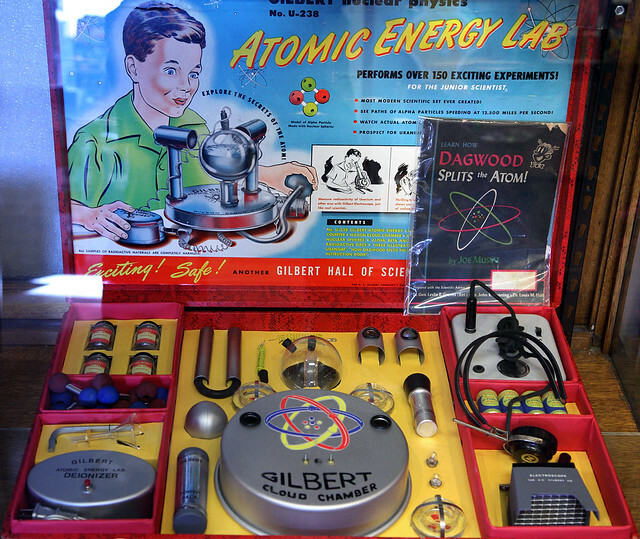 The most amazing thing was a Gilbert U-238 Atomic Energy Lab, which was sold around 1950 and contained four different radioactive sources and four jars of different uranium ores, along with a cloud chamber and Geiger counter to do experiments with them! Wow, those were the days. We spent some time perusing all of the various toys in the room. We went in thinking the museum would be kind of lame, but left impressed with the range of amazing toys (and PEZ dispensers and other memorabilia). It was well worth the entry fee and a great time to spend our last afternoon in the San Francisco area. Leaving, I decided to buy a PEZ dispenser for my wife as a souvenir. She likes Smurfs, so I looked for one in the shop area. There were none in the new section, but in the collectibles area there was a sealed plastic bag containing a set of five different Smurf dispensers... for $90. I asked the man if he had any Smurfs that might be a bit cheaper, and he said they were a limited release from about ten years ago, but he thought he had a few Papa Smurfs out the back... He vanished and reappeared with a Papa Smurf dispenser in its original packaging and said it was $9. So I bought it, and he told me the candy inside wouldn't kill me, but it probably wouldn't taste very good so he didn't recommend eating it. So equipped, we left the PEZ Museum and walked back to the hotel. We picked up our luggage and took showers in the gym changing rooms, then headed out to catch the shuttle bus to San Francisco Airport and our flight home. Last updated: Thursday, 14 September, 2017; 00:15:36 PDT.